Going out to eat can be so much more when you join us at BJ's Restaurant & Brewhouse in Noblesville. Our inviting atmosphere and world-class service makes us a great place to meet up with friends or spend some time with the family. We offer delivery for those who can't get away, or take advantage of our curbside pickup and take out services. We're also available to cater your special event. Download our menu to see all the choices for great food, including our renowned pizza. Before it's all done, don't forget to try the world-famous Pizookie®! 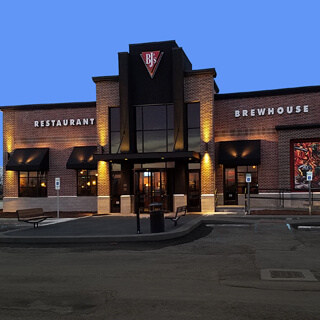 While BJ's Restaurant & Brewhouse is one of the nation's most popular spots for eating out, we started as a small pizza shop in Southern California. With hard work and an unmatched devotion to our customers, we began developing a reputation for a local twist on Chicago Style Pizza. This was back in 1978, and today, you'll be hard put to find a better place to enjoy your next meal than BJ's Restaurant & Brewhouse in Noblesville. Chances are that you'll find the perfect deep-dish pizza on our menu, but if you don't, we'll go make it for you. Our menu now extends well beyond our famous signature pizzas. A wide variety of shareable appetizers are a great way to start any meal, and our Enlightened menu has a tasty variety of healthier options that make going out for dinner even more enjoyable. Our handcrafted burgers are among the favorites from our menu, or consider one of our delicious pasta dishes. No matter what you're in the mood for, we look forward to exceeding your expectations. Few meals are complete at a brewhouse without a good beer, and that's exactly what you'll find throughout our 11 award-winning handcrafted beers. These are beers that have resulted from over 20 years of experience and have earned over 160 awards. Don't forget to ask us which rotating seasonal beers are currently available. While you enjoy your beer, consider helping us recognize teachers as heroes and buy a beer for one of our local heroes. We believe heroes are everywhere, and we're excited to be a part of the greater Noblesville community. Our team members are encouraged and incentivized to take a more active role in the community, and there's a good chance that you'll meet us at local clean-up efforts, blood drives, or perhaps even a Habitat for Humanity project. We also work with BJ's Foundation to help promote the health and education of children throughout the community. Help us give back by visiting our location for your next meal out or beer with friends at 13003 Campus Parkway Noblesville, IN 46060. We can hardly wait to meet you at BJ's Restaurant & Brewhouse. We are excited to be part of the Noblesville community!